3" Comfort Dunlop Latex - The top layer is made of superior quality latex foam that’s blissfully comfortable and will absorb motion. This layer is pure luxury, made to cushion you as you sleep. The latex is breathable, making for a cool night’s rest. 3” Support Dunlop Latex - is firmer than the top layer, to provide support under the soft top layer. The Support Dunlop Latex is denser and heavier, to provide a durable transition between the contouring of the top layer and the firm stability of the base. Your pressure points will love this layer. 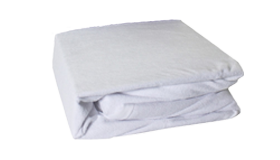 6” Base Support Foam - The foundation layer is high density, providing structure and durability. Thanks to this layer, you’ll have many more years of enjoyment from this mattress. The top layer is made of superior quality latex foam that’s blissfully comfortable and will absorb motion. This layer is pure luxury, made to cushion you as you sleep. The latex is breathable, making for a cool night’s rest. is firmer than the top layer, to provide support under the soft top layer. The Support Dunlop Latex is denser and heavier, to provide a durable transition between the contouring of the top layer and the firm stability of the base. Your pressure points will love this layer.